I can't believe it's Day 5 already! For today I decided to do a green smoothie version of the Master Cleanse Lemonade, which I know sounds kinda weird. I was running out of ideas and my mom mentioned her co-worker was doing it. I felt a little tickle in the back of my throat and some dizziness, which is a bad sign and cayenne pepper works like a charm for sore throats so I thought this drink would be a great "pick-me-up". I've been sipping on it all day and I feel much better! 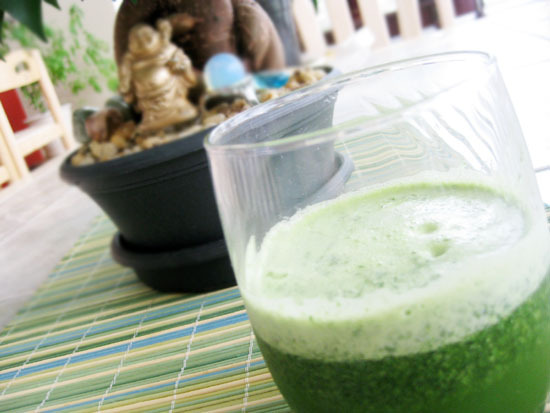 For another super healthy green drink, my Day 4 entry is also a great smoothie to prevent colds and ease indigestion. Smoothie will be very thin, almost juice-like.